The hip, young neighbhorhood of Bushwick, Brooklyn is home to an impressive variety of shops, bars, restaurants, and characters. But until we walked into UpNorth, we had no idea it was also home to a Canadian-themed bar. 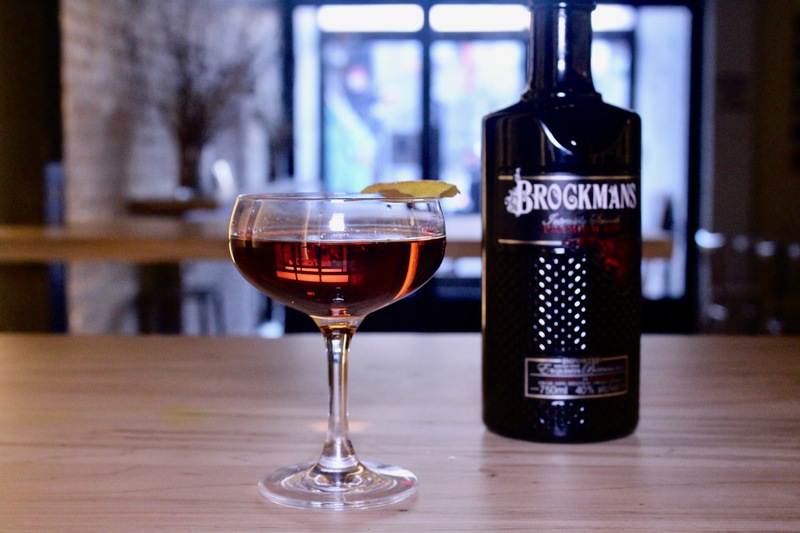 James himself is not Canadian, but the two owners are from Montreal, and after opening a successful whiskey-and-grilled-cheese bar a neighborhood over in Williamsburg, they fancied it was time for an homage to home. Lest the “theme” get a little too on the nose, however, the bar doesn’t scream Canada, nor should it. Instead, it is high-ceilinged, with modern lines and lot of light wood. Canadian flags are peppered around the space, and a framed portrait of Prime Minster Justin Trudeau sits on one end of the bar, almost like an actor’s headshot the bar owner displays proudly. The menu features a lot of poutine, Montreal’s famed signature dish, and James tells us that has been a huge hit. After all, what better bar food is there than chips with melted cheese and gravy? But it is, of course, in the drink menu where the real gems lie. 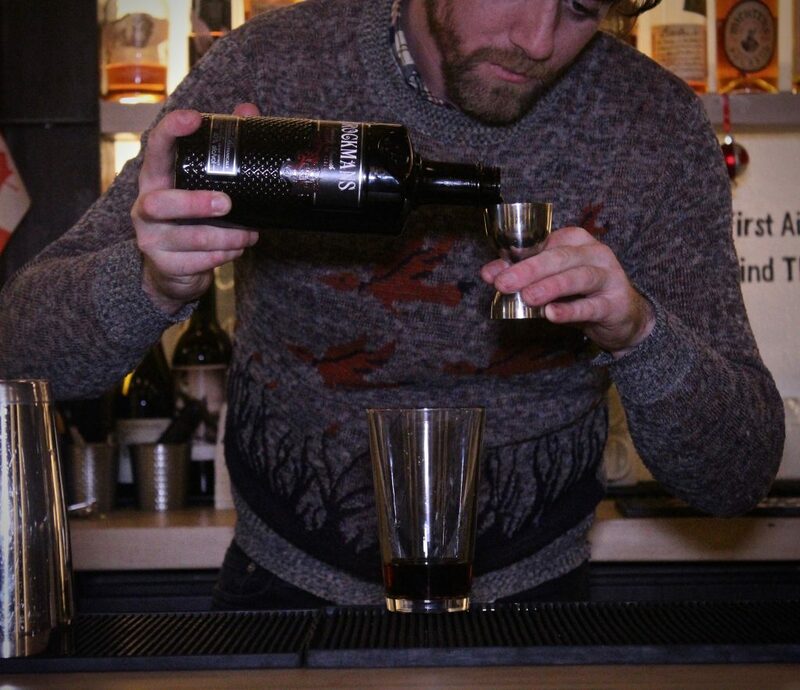 Although James is happy to nod to Canada whenever possible, he tells us the owners in no way oblige him to stick to Canadian spirits or flavours. 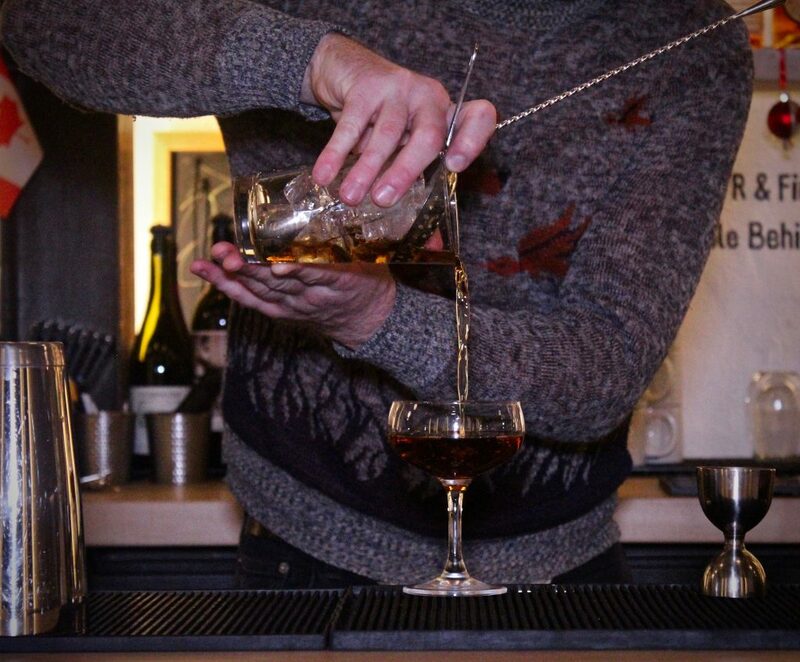 Having worked at several bars around the city, and trained alongside some of New York’s more well-known bartenders, James is grateful he landed at a place that has clout, but not too much clout. True to form, James has indeed made UpNorth one of those places, a neighbourhood bar with a diverse crowd, satisfying bar food, an extensive beer selection, and, perhaps most enticing to us, an innovative drink menu. James pulls out a bottle of Brockmans, that he has labeled “Peanut Butter.” We must know more. James explains he infused peanut butter into the Brockmans using a method called fat-washing, where you infuse the flavours from fats into alcohol by freezing them together overnight, then straining out the fat the next day. Admittedly, we are skeptical. Peanut butter gin? But he pours out a bit for us to taste on its own, and it is remarkably delicious. It does taste like a peanut butter and jelly, but a sophisticated peanut butter and jelly, if that were even possible. James studies our reaction, and smiles when he sees we like it. Whatever it is, we cannot wait to try it. 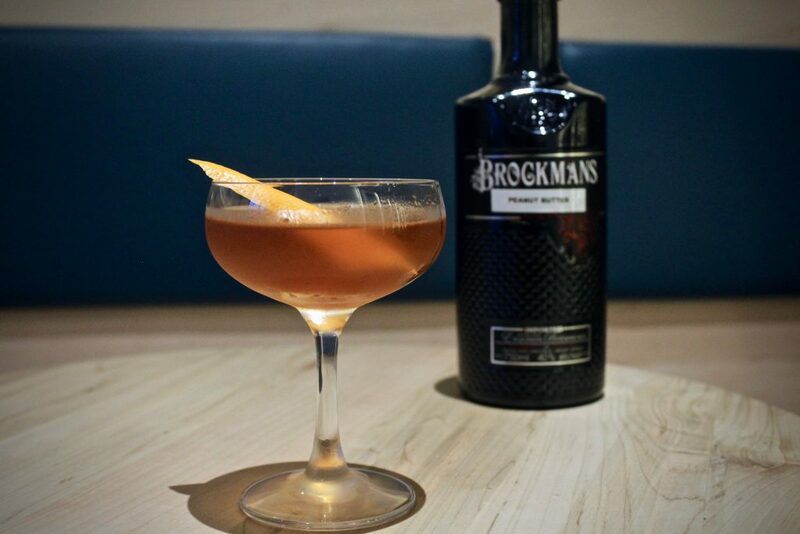 We have tried quite a few different Brockmans creations throughout the years, but peanut butter-infused Brockmans might just be completely new. True to his word, James doesn’t add too much to his peanut butter gin. Just a barspoon of Maraschino liqueur, a touch of a locally-made bitter aperitivo, and some sweet vermouth. These ingredients balance the peanut butter gin nicely, adding sweetness, bitterness, and roundness. 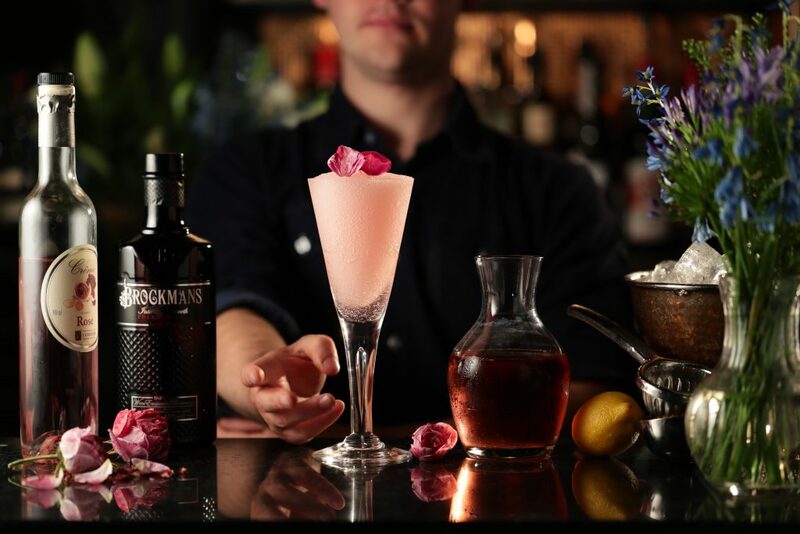 The resulting cocktail is a touch rich, a touch savoury, and a touch complex—and most impressive, we can still taste the berry notes from the Brockmans at the end. This drink is both incredibly out there and yet also incredibly simple. Add all ingredients to a mixing glass, and fill with ice. Stir for 15-20 seconds, until the mixing glass is cold. 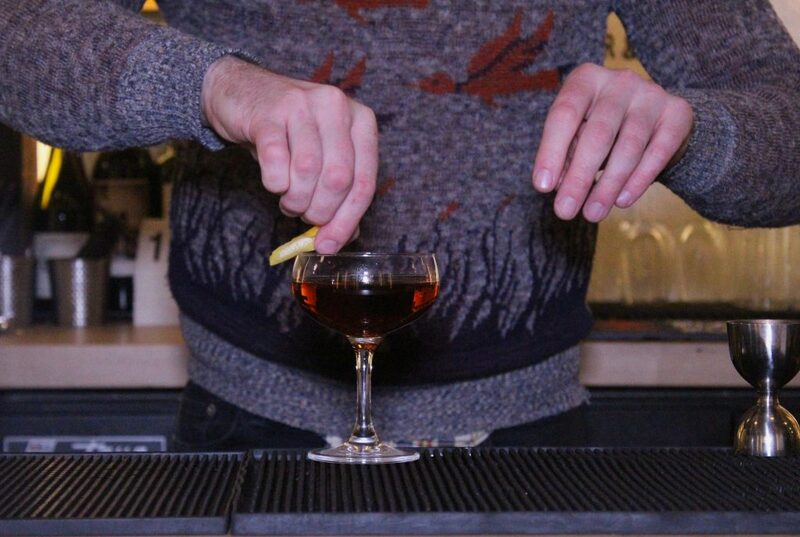 Strain into a chilled coupe, and garnish with a lemon twist. Take a 1 lb/1.13 kg container of peanut butter, and spread it in a sealable container–ideally a wide, shallow one, to get as much surface area of peanut butter as possible. 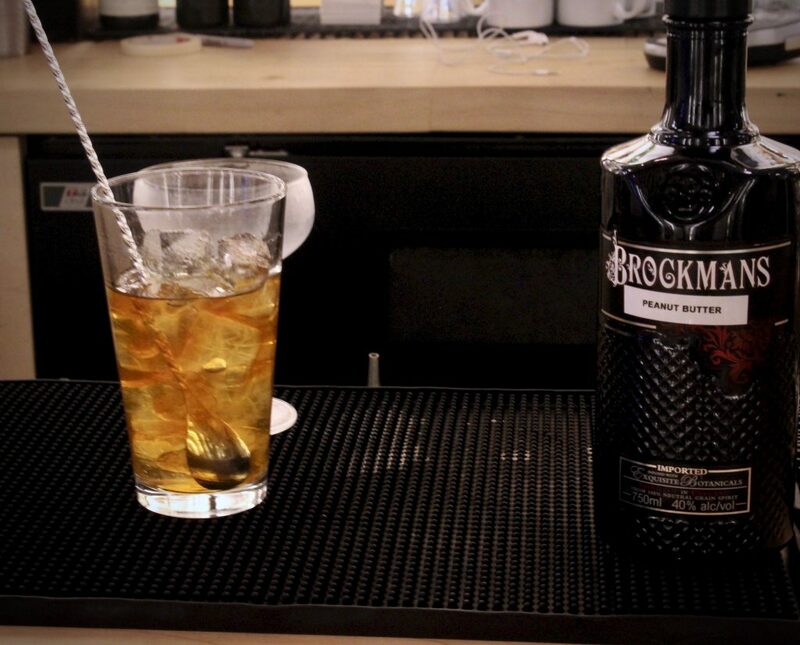 Pour in a bottle of Brockmans Gin, and close the container. Strain out the peanut butter the next day through a coffee filter, or a chinois, or the finest way possible.